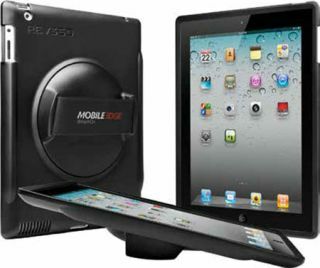 www.mobileedge.com ■ Retail Price: About $59 per case, discounts on bulk orders (education discounts available). The Mobile Edge Rev360 Rotating Case for iPad combines the sturdiness of a thermoplastic iPad case with the comfort and versatility required for optimal manipulation of the iPad to interact easily with colleagues or students without constraints. Equipped with a one-size-fits-all strap that securely fastens to your hand and a rotating disk that allows for portrait or landscape mode or anywhere in between, the Rev360 rotating case provides both the best viewing angle for any situation and comfort at the same time. The Rev360 is available in three models: Black, Black with Smart Cover Compatibility, and Black with Shoulder Strap. We had the opportunity to run this case through the rigors of our Pre-K through 8th grade 1:1 iPad initiative. We put this case in the hands of both our teachers and students to gain their experience and feedback on the practical use(s) of this case in a school setting over the course of six months. Quality and Effectiveness: The use of thermoplastic ABS made this iPad case virtually unbreakable, even in the hands of our very young students. With more moving parts, as found in the rotating disk, you would expect there to be more opportunity for failure or that it could be more easily broken. However, no matter how hard our teachers and students tried, they could not break or impair the use of the rotating disk. The flexible hand strap is made of quality elastic fabric and did not come close to ripping during our extensive trial. Also, the strap did a great job of conforming ergonomically to most teachers, and students, hands. The comfortable, yet snug, hand strap made it very easy to hold onto the iPad, even for teachers and students who like to wave or communicate with their hands. The multifunctional shoulder/neck strap provides other opportunities for easily manipulating the iPad in a hands-free mode, as well as making the iPad easier to carry from class to class. Last, the ability to rotate the device while working made the Rev360 ideal for students working in a 1:1 or small group setting. The rotating palm pad or disk not only allows for a more collaborative session, but our teachers found it easy to switch from attaching it to their hands to using it on a desk, thanks to its built-in stand properties. Suitability for Use in a School Environment: Our teachers found that using the Rev360 “has been great” and that it was “fantastic to use in class.” Its comfort and versatility make it useful in a variety of classroom settings. The only wish list request from our teachers was to add some sort of screen cover or protector. While the Rev360 has a model that allows for a Smart Cover to be used while transporting the iPad in a backpack or on the shoulder strap, our users reported they would feel more confident if their screens were protected while in use during a lesson. • The comfortable and ergonomic design of the rotating hand pad and strap and the easy ability to manipulate the touch screen of an iPad makes this case a good choice for teachers. • The optional shoulder/neck strap and the rotating disk stand make this case very versatile in a variety of classroom settings. • The sturdiness and ruggedness of the thermoplastic ABS case, coupled with the virtually unbreakable rotating disk and flexible, elastic hand-strap, makes this case a valuable tool to any teacher.